I'm a size 16 and I ordered a 3XL. I could have ordered down a size or two. It was to big so I had to pull the pants all the way up to under my chest area which made it look like a one piece instead of a two piece but I made it work. I add a gold belt with a little bling on it. It was super cute. It has a lot of stretch. I got a lot of compliments. Overall, I am pleased. I will order again. Exactly as pictured, and also comes with head band. Has stretch so order your normal size. Very cute! I love this set! it fits true to size. 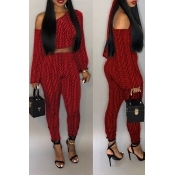 I LOVE THIS TWO PIECE ITS VERY NICELY MADE . You can wear it in fall and spring. The head band is not included. The material is stretchy a little. Our size is standard size, barely of our customers have the size problem, please do not worry.